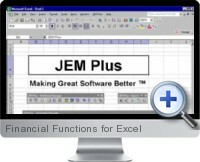 Financial Functions for Excel (JEM Plus) is designed to add productivity to workbook and worksheet management in Excel as well as providing a large set of financial analysis calculations and functions. Utilities added to the Excel menu cover a wide range time saving tools for reporting information and managing tasks within workbooks and sheets. Moreover, over 200 powerful functions are added for dates, system information, logic, string manipulation, human resources including 173 financial functions. Bankruptcy Functions - Altmans Measure for Business Failure Index for Private Owned Manufacturer, Private Owned Non-manufacturer and Public Owned Manufacturer. Bonds - Taxable Equivalent Yield. Capital Tangible Investment - Accounting Rate of Return, Average Accounting Rate of Return and Payback Period. Cash Management - Cash Conversion Cycle, Target Cash Balance (Baumol and Miller-Orr), Trade Credit Rate and Working Capital. Cost Accounting - Break Even (Dollars/Units/Contribution Margin), Inventory (EOQ Economic Order Quantity points and costs), Learning Curves, Actual/Normal/Standard Costing (Direct/Variable/Fixed Costs and Factory Overhead), Rates (fized/Variable/Fringe Benefit), Standards/Budgets/Variance (Labor and Material Mix/Yield, Market Share/Size, Sales Control/Price/Volume Variance) and more. Derivatives - Return on Warrant and Value of Call/Put/Stock Right/Warrant. Fundamentals - Activity (Accounts Payable/Receivable Turnover/Days, Inventory/Assets), Assets (Deferred Charges/Intangibles/Repairs/Retained Earnings /Equity ratios), Expenses (Categorized calculations and ratios), Leverage and Liquidity (Balance Sheet item ratios), Profitability and Capital Market (EBITDA, Earnings, P/E, Sales, Margin, Book, ROI and more ratios), Solvency (Coverage, Cash Flow and relevant ratios). Market Indicators - Barrons Confidence Index, Bearish Sentiment Index, Breadth Index, Puts to Calls, and Odd Lot indexes. Market Investment - CAPM, Sharpe, Continuous Compounding Rate, Effective Annual Interest, Perpetuity, Present Values, Short Sales and more.